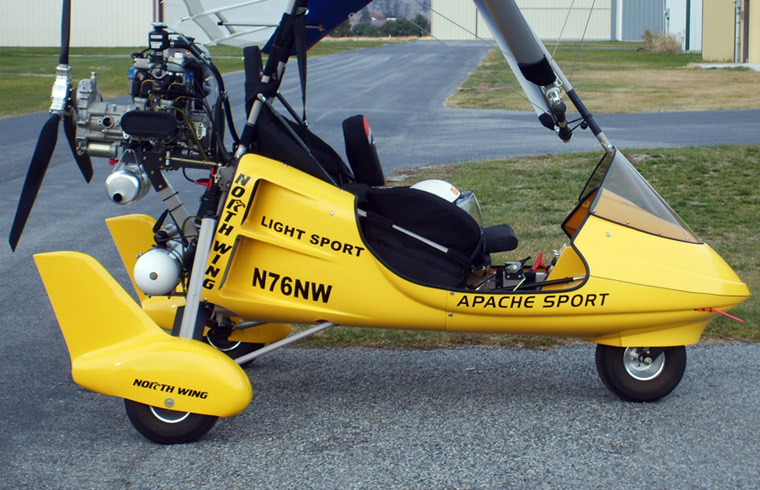 The Sport X2 Apache · Light Sport Trike airframe is a revolutionary design incorporating sport aircraft design suspension, welded 4130 aircraft steel main structure (Back Frame), 4130 dual mast and trailing link front steering. 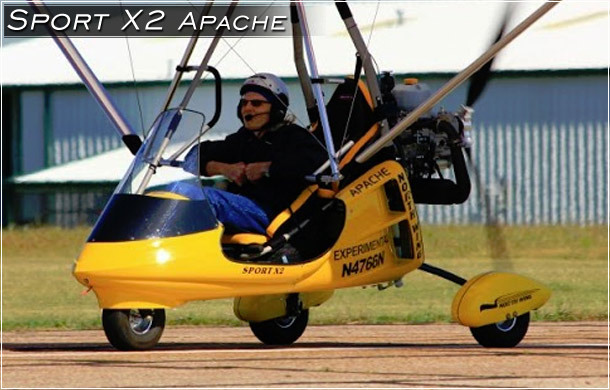 Unlike the tube-and-plate constructed trikes with their single mast, drag struts, side support cables and bungee cord suspension, the Sport X2 airframe will maintain its structural integrity for years to come. 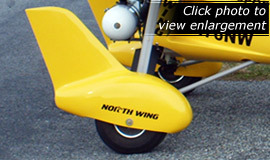 You can enjoy years of sturdy and confident flying knowing your trikes' rugged and well-designed suspension won't get worn out. The Sport X2 Apache can be ordered with a variety of options. The Sport X2 is certified as a Special Light Sport Aircraft when paired with the powerful and reliable Rotax 582 engine and the Mustang 3 15M light sport aircraft wing. 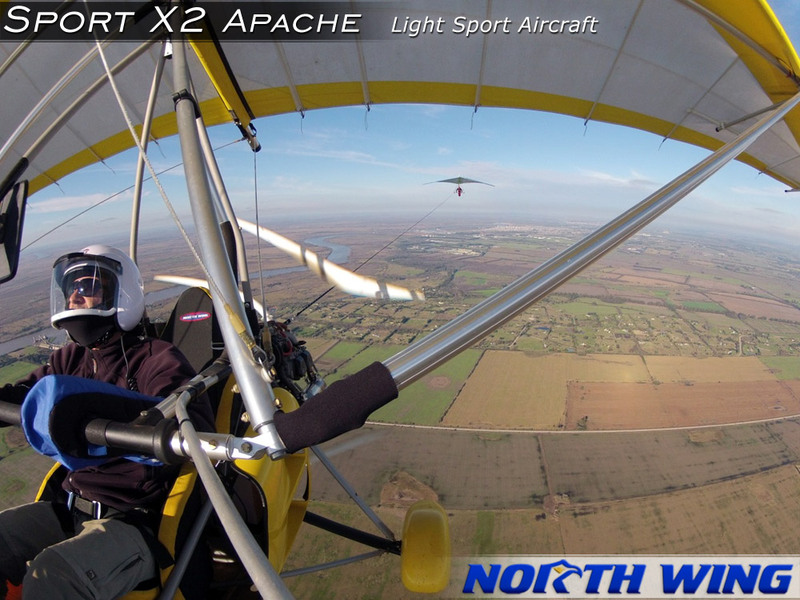 You can also fly the Sport X2 as a Experimental Light Sport Aircraft when using any other engine and/or wing configuration. The Sport X2 Apache provides a nice layout of gauges with room left over for your custom needs. Here you also see the rugged yet keen design of the Apache front fork wheel system. 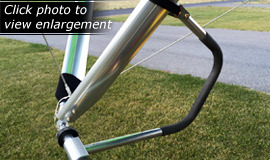 You will appreciate the solid yet responsive feel of its trailing link suspension. The front suspension works so well, it survived a full front wheel landing at 60 mph! The Sport X2 Apache wins the Sun n' Fun 2009 "Outstanding Weight Shift Light Sport Aircraft Award"
Click here to view a photo. 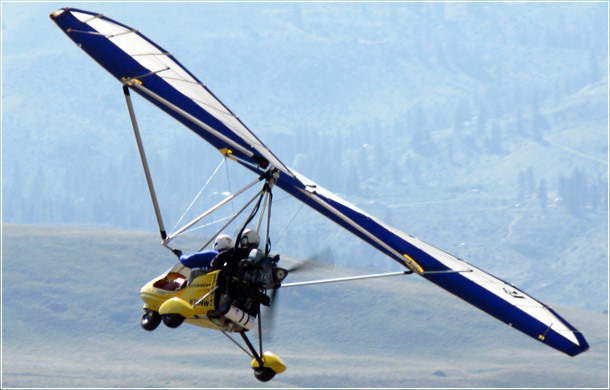 Built in the USA, our Light Sport Aircraft are known for rugged aircraft-quality hardware throughout the frame and wing. 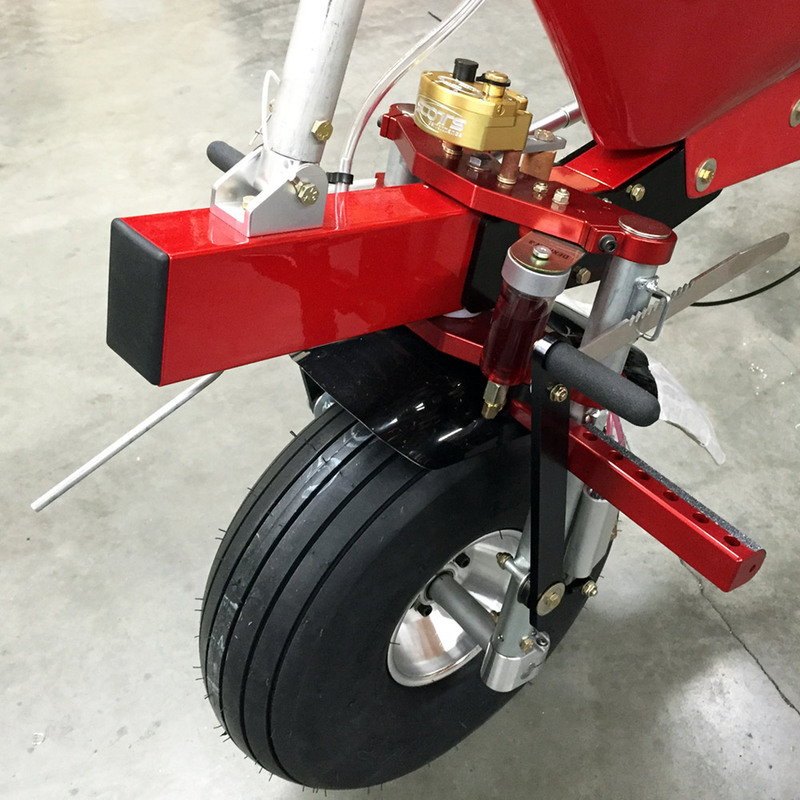 Our use of AIRCRAFT GRADE Matco Brakes and Grove Aircraft Landing Gear ensure you have the best components for stable and strong take-offs and landings. Compare this to others, before you buy. 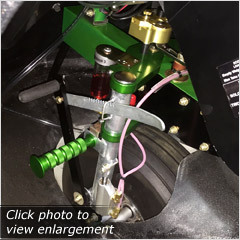 New Front Suspension is very rugged, with improved Steering, Tracking, and includes top-of-the-line SCOTTS Steering Stabilizer. The Sport X2 Apache comes standard with the powerful and reliable 2-stroke 65HP Rotax 582E engine, and includes an Oil Injection Tank so there is no need to pre-mix your fuel. Electric Start makes it easy to buckle-in and get in the air! The Sport X2 Apache features a streamlined fairing design with rugged strength and convenient storage space in side saddlebags, and includes air induction vents for cooling. 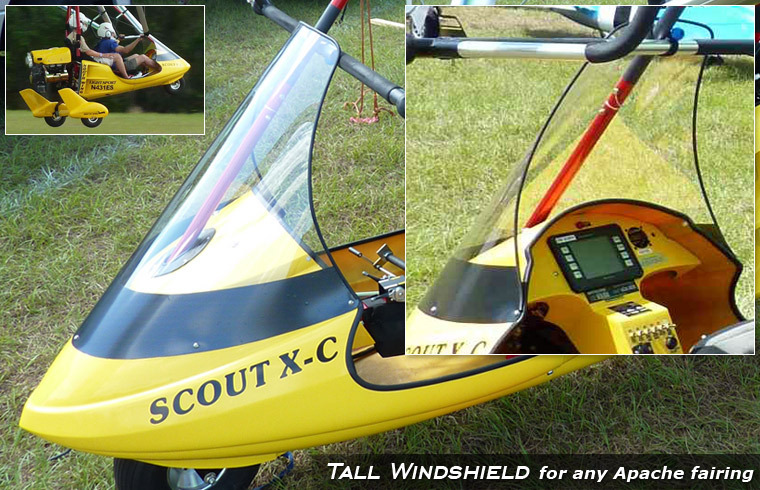 The integrated tall windshield is perfectly sized and matched to the fairing for low drag and efficient wind deflection. Fairing and Wheel Fairings colors include Red, Yellow, White, or Black. 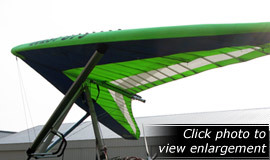 If you have another color choice, talk to us about a custom color light sport aircraft for you. The Sport X2 Apache instrument panel area has ample space for gauges, electronic flight information systems, and many switches. A digital Engine Information System display is centered on the Instrument Panel to monitor essential engine functions. 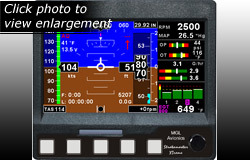 Analog gauges include a Fuel Level gauge at the far left side, and Airspeed Indicator on the right side. A 12-volt power receptacle is included for powering GPS or other accessories. 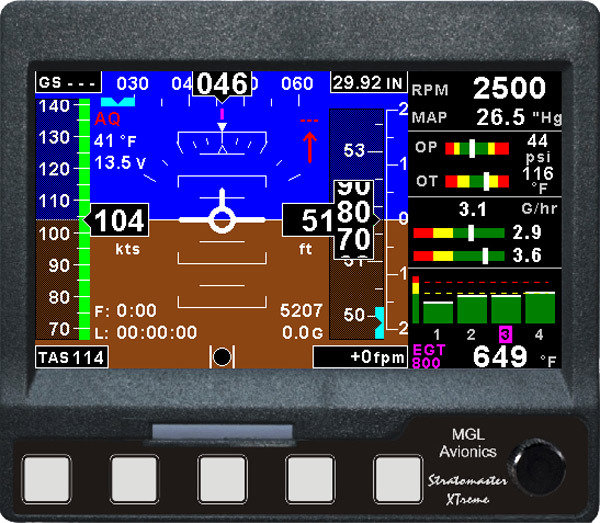 Consider upgrading to the Stratomaster Horizon EFIS for additional "glass cockpit" features when you order a new Sport X2 Apache. 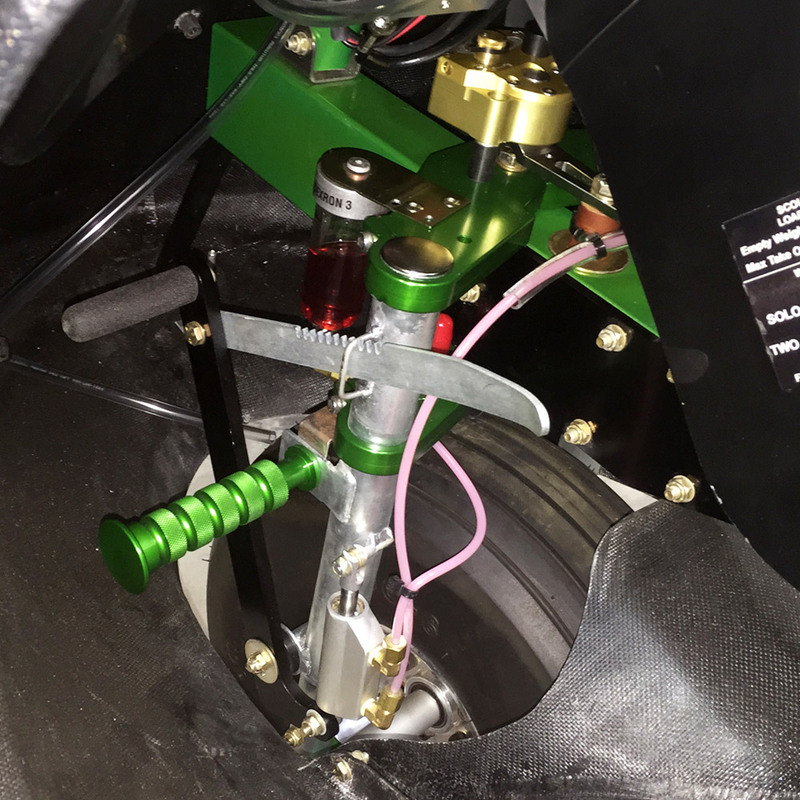 The Apache's front fork and suspension system has been further improved by the addition of an adjustable Steering Stabilizer to minimize front-end shimmy during fast landings or crosswinds. Its suspension (shocks) is of our own design, crafted of elastomer spring material such as used on commercial aircraft and mountain bikes. You will appreciate the solid yet responsive feel of our trailing link system. Best of all, the whole fork assembly is made of thick 6061 aluminum plates that bolt together, so parts can be easily replaced if necessary after a hard landing. 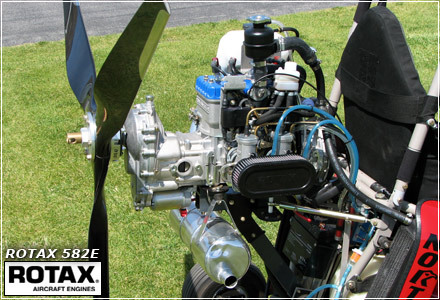 The Sport X2 Apache features the 3-blade, 72" Warp Drive Propeller as standard equipment, a very good propeller for the Rotax 582E engine. 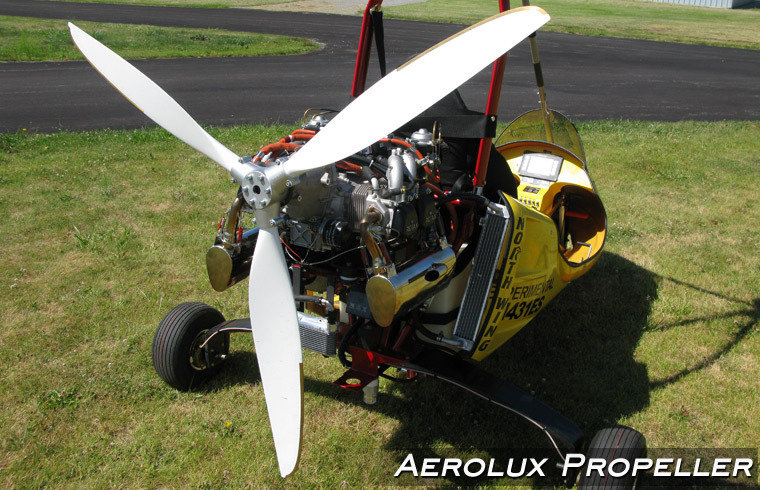 For improved fuel economy, lower RPMs, and overall appearance and high quality, consider upgrading to the Aerolux 3-blade Propeller. The Sport X2 Apache features Aircraft-grade Matco Brakes as standard equipment, ensuring very efficient braking while on the runway. The Sport X2 Apache includes dual Magneto Switches accessible from the rear seat, coveniently located within the streamlined fairing. 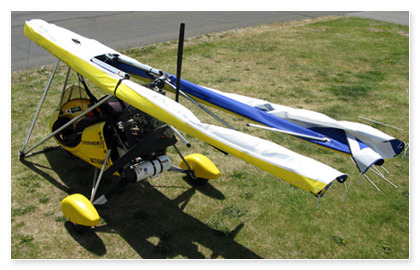 The Sport X2 Apache has steering and throttle accessible from the rear seat, very important for light sport training. The Sport X2 Apache includes two saddlebags for storage, one on each side of the seats. They each have two storage pockets with zipper closure. Sore back? Tired of lifting a 110-pound wing into the air? The Sport X2 Apache includes gas-assist springs to aid you in lifting your wing up! No longer do you need to lift 100+ pounds into the air; with the springs attached, you will be lifting less than 20 pounds. We also have a retro-fit kit for you, if you already have an older Apache. The Sport X2 Apache includes a large 13.5-gallon Fuel Tank (12.75 gallons usable). After seeing the difficulty of adding fuel to most trikes, we had our own tank made. This allows us to put the fuel filler in very accessible location. The Sport X2 Apache now comes standard with our new Tall Windshield. The new tall windshield reduces drag, and spares the pilot from excessive wind forces while cruising. The Sport X2 Apache has a folding front seat back rest, allowing easy access to the rear seat. The rear seat has a 3-point harness, and the front seat has a 4-point harness. The Front Seat can be adjusted within a range of 4" of travel, very convenient for light sport instruction. 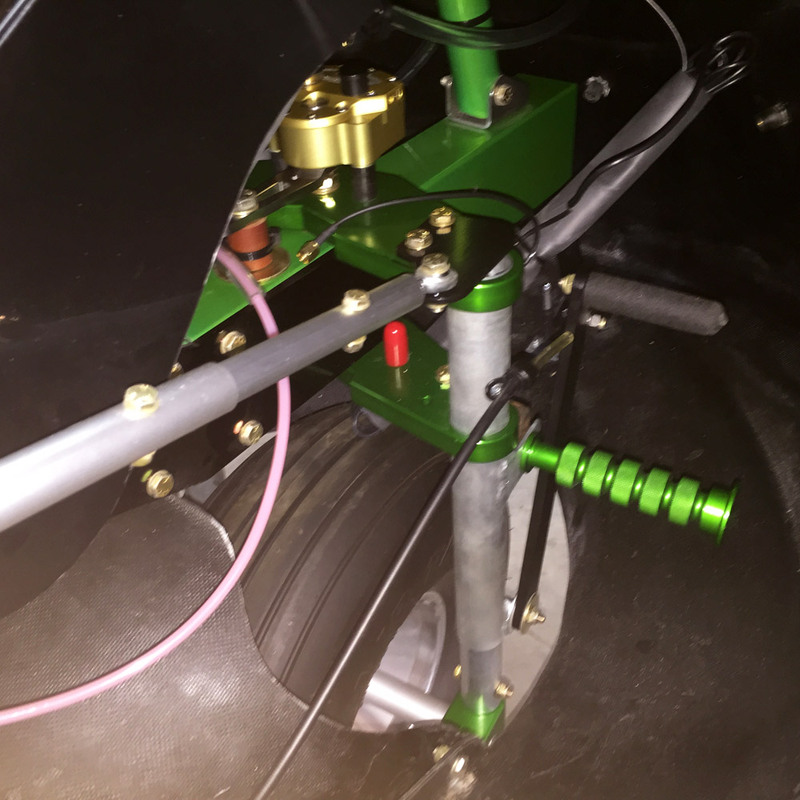 Our light sport aircraft that have electric start come equipped with our custom-designed electrical Fuse & Relay Box. This box makes it very easy to add options, such as strobes and radios, in addition to minimizing any electrical noise that could affect radio communications. 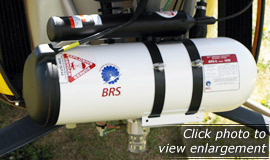 We also use only the highest quality "Keywest" regulator. Click here to view the Fuse & Relay Box installed behind the rear seat. Click here to view the Strobe Light electronics installed under the rear seat. Click here to view the Fuse & Relay Box and Wiring Harness. A most unique quality in the Sport X2 Apache design is the strong and durable welded chrome-moly and steel spine (back frame). 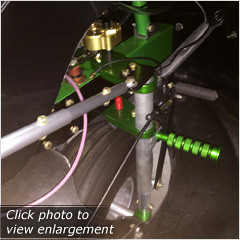 All other major trike parts either bolt on, or plug into this fixture. This makes the Apache less expensive to repair and easy to work on. 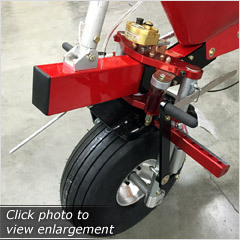 If you happen to have an incident while training where you might damage the trike, less expensive parts may need to be replaced and not the main supporting structure. The Sport X2 Apache features an Electric Start, and Throttle and Remote Choke are conveniently located right in front of you. 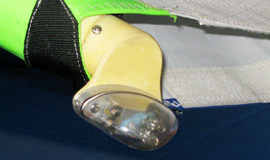 A foot throttle is also included, and an all-weather 12-volt DC outlet for GPS or other accessories. The Sport X2 Apache comes with a Strobe Light as standard equipment, providing additional visibility and safety for your flights. The Scout XC Apache features a strong and rugged 7075 Aluminum Leaf Spring Suspension. The leaf-spring suspension reduces drag with its slim profile, and its strength eliminates the need for the additional drag struts and load springs. This innovative new suspension design provides soft and positive landings. 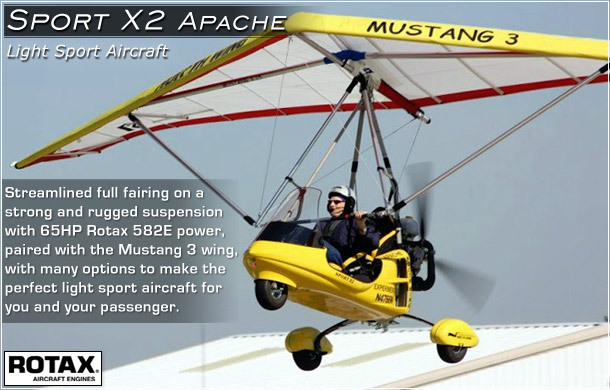 The Sport X2 Apache's Mustang 3 Wing folds back while still mounted to the aircraft, for your convenience. 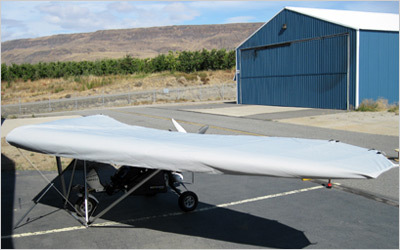 This is a great feature for wind-protection between flights, and saves space when in the hangar and during trailer transport. Upgrade the standard single-surface Mustang 3 wing to the double-surface Quest GT5! The Quest GT5 is a highly refined, strutted wing capable of a 45 mph range of speed from stall to top speed. One of the most impressive achievements in the Quest GT5 is the light handling both in pitch and roll. 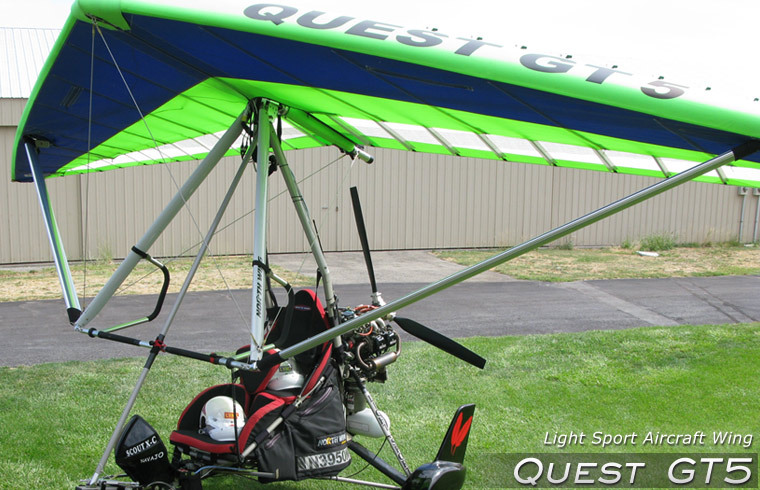 Click here to view more information about the Quest GT5 Wing - for advanced 2-place flying, perfect! • All screen items can be enabled or disabled. (eg: Altimeter dial, tape, or digital-only). • All screen items can be moved around the display for custom layout. • Results in 5% to 10% better fuel economy. • Blades have longer and wider metal leading-edge protection. The Finned Wheel Fairings option for the Sport X2 Apache provides low-drag wheel enclosure with added tracking stability from the finned fairings. Upgrade the standard Wheel Fairings to Finned Wheel Fairings when ordering your new Sport X2 Apache. Available in red, yellow, black, white. 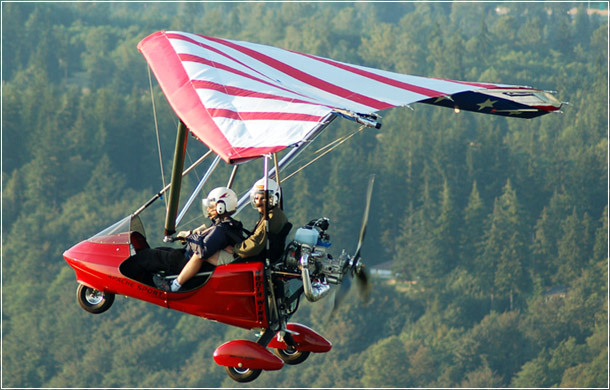 Improve your visibility among traffic during early morning and evening flights for added safety! 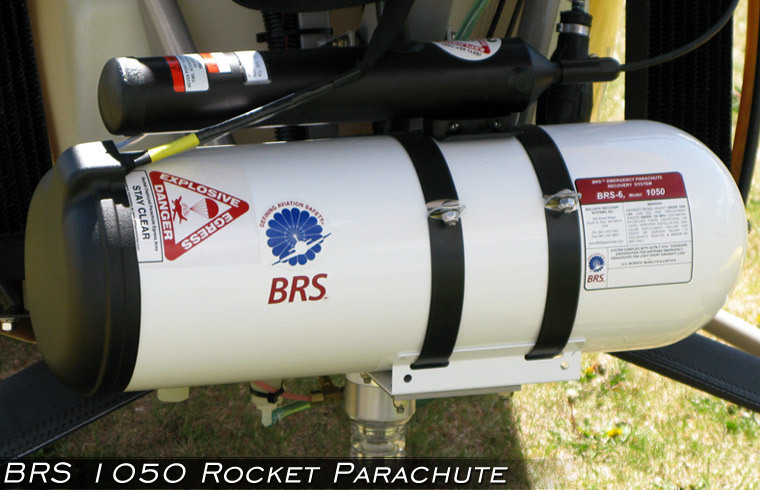 Consider this important safety option when you order a new light sport aircraft. 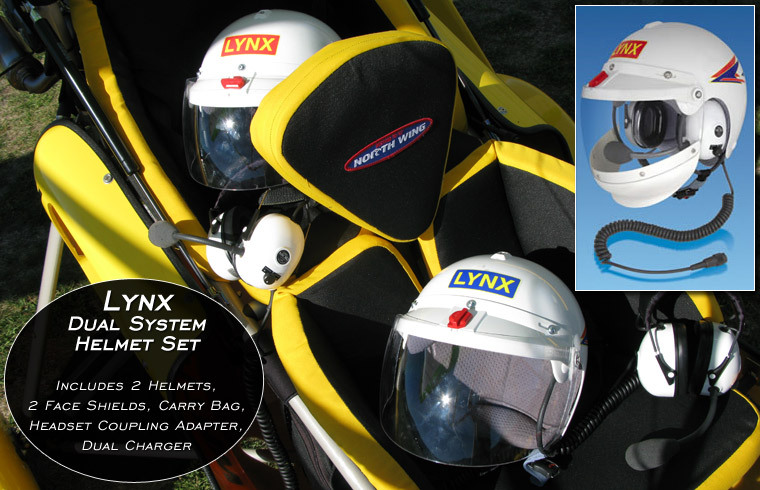 Includes 2 Lynx Helmets, 2 Headsets, 2 Face Shields, Carry Bag, Headset Coupling Adapter, Dual Charger. 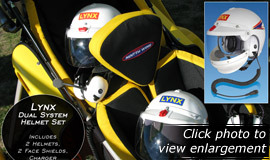 The helmet has an outer shell of high-impact Polycarbonate and an internal trauma liner made from a combination of Polystyrene and Viscoelastic Polyurethane. Exceptional performance in high noise and wind environments. 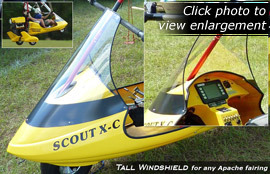 The Tall Windshield for Apache Fairings is a great addition during XC flights or anytime you want the comfort behind this aerodynamic, tall windshield. 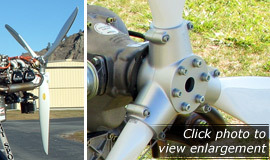 For any Apache light sport aircraft fairing. Standard Equipment on new Apache light sport aircraft. 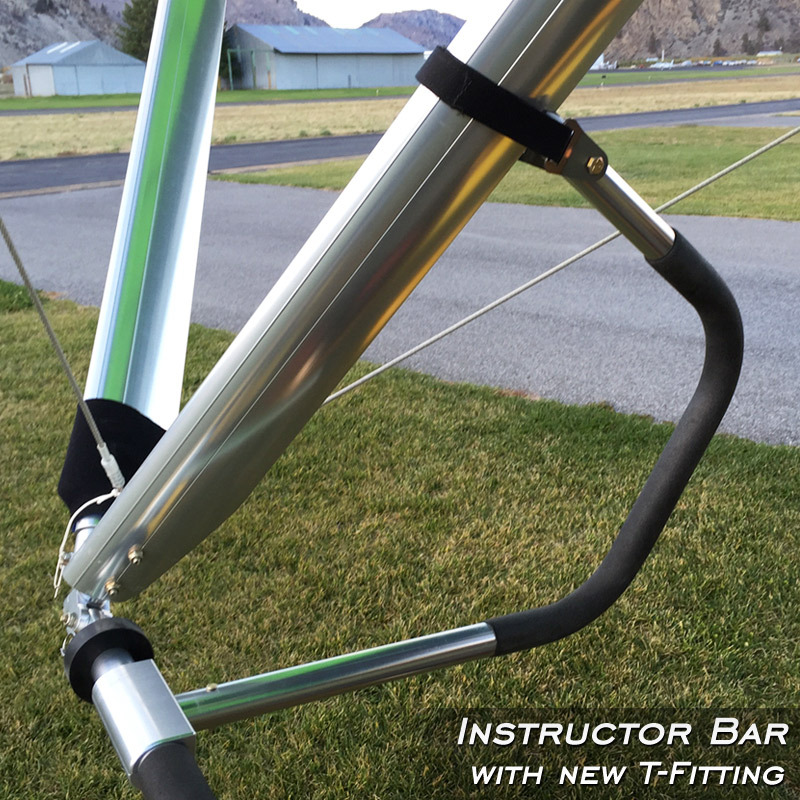 • Easy to quickly attach or remove Instructor Bars from wing! • NEW streamlined design requires NO DISASSEMBLY and NO TOOLS. 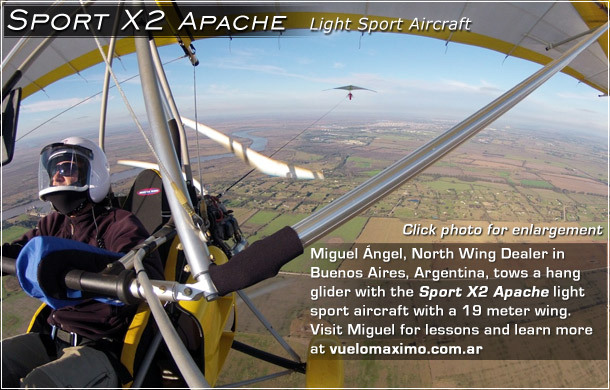 • For light sport aircraft professional training. Click Here to view a brief Video showing the new Quick-Attach features. 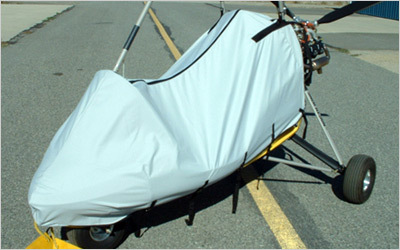 Protect your Apache light sport aircraft with fairing from snow, rain, dust and UV with the North Wing Apache Cover.